If you got an aquarium at home or interested in getting one, you've got to either know everything about fish or get expert advice. We found this street near Secunderabad Railway Station with plenty of aquarium stores. Right from fish of diverse species, plants and accessories to free advice on maintenance and more, get it all here. With two outlets on the same street, Sri Sai Aquarist is where you'll find more than just fish. Rabbits, birds of different species are also available here. We also found handpainted snails that resemble bumblebees and these can entirely up your aquarium game. Plus, you'll find your regular species of fish like Mollies, Angels, Goldfish that share space with Betta, Cichlids etc. Jasmine is a haven for aquarium hobbyists as they will find plenty of accessories like pebbles, live plants, decorative plants and various kinds of tanks and decorations. 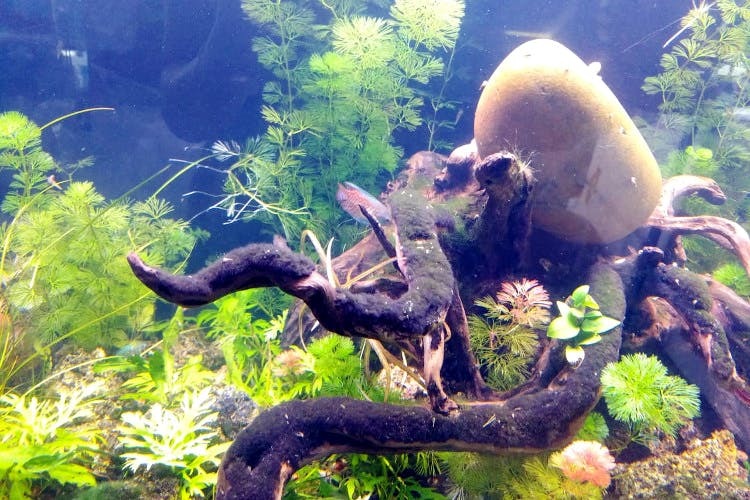 Want to build a castle in your aquarium? Get one here. Find species like Oranda, Tiger Barb, Zebra Cichlid along with regulars like Mollies, Goldfish, Guppies, Angels. Plus, you can find Nemo here. One of the biggest stores in the street, this one has the most exotic of fishes. The price range of the fish goes up to INR 5,00,000. Species like Flower Horn, Arowana, Black Ghost Knifefish, Tetra, Oscar Cichlid, Koi, and more are found here. The accessories are quite alright, but the store person has a great deal of knowledge about fish and you can strike a conversation to get started with an aquarium if you are a beginner. You can also request for the species you like. Although at one point of time Vyas had the most exotic of fish, they only have regular breeds now. We have heard raving reviews about the store person who has epic knowledge about fish. So, if you're interested in getting started with a small aquarium and learn the process of caring, this store is your best bet. We found the owners at Rohini quite irresponsive but the store has a decent collection of fish. Here, you'll find Parrotfish, Flower Horns, Betta. They bring in new stock every Sunday so expect rare species on that day. Apart from fish, they have various species of birds and accessories like colourful cages etc.